Mission of the Month: Sky Bears & Other Creatures! 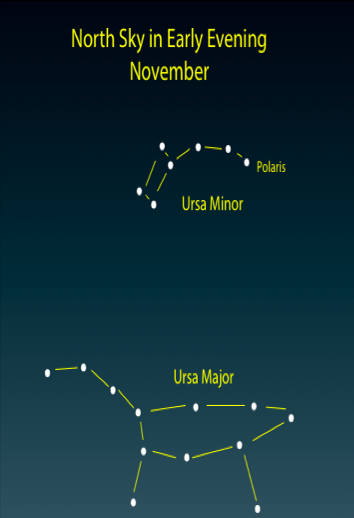 In the star lore of the Micmacs in Canada, the Big Dipper is part of the Big Bear Constellation. When Big Bear returns to the earth, hibernation season begins. Other components of the story include the three hunters chasing the bear around the sky. In autumn, the hunters finally catch the Bear. It’s said that the blood from the Bear colors the leaves of our autumn landscape. In another version of the story, Celestial Bear hits its nose when coming down to Earth, with its bloody nose giving color to autumn leaves. When Celestial Bear is seen right on the northern horizon on late fall and early winter evenings, it’s a sure sign that the hibernation season is upon us. Find out more about the Big Celestial Bear. Other cultures created myths around the Big Bear Constellation. The Zuni Indians believe that the Celestial Bear guarded their lands from the frozen gods of the north. When the bear went into hibernation in winter, their lands were invaded by the breath from the ice gods. The early English said that King Arthur lived in this area of the sky, and that the stars formed his chariot, slowly circling the North Pole. What other myths can you find? Activity: Recognizing Patterns: Try this activity for help finding and identifying star patterns and create small ‘planetariums’ with the pattern of a single constellation. Activity: Creating Stories: Use this activity to identify a pattern of stars in the sky, ‘draw’ a shape around that pattern to represent a story or myth, then create the story or myth about that shape.